I hope you all had a great weekend! We're busy packing and getting ready to move two states away, so it's been chaotic around here. We will be back in our hometown, though, with all of our immediate family and most of our extended family, which we are super excited about, especially with having a kid now. In the midst of all this craziness, however, I am still (somehow) finding time to cook. 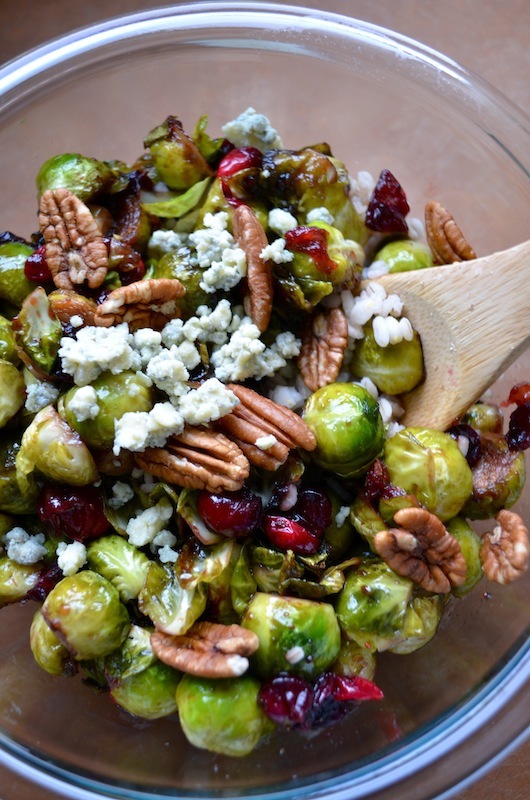 This week's Pinterest recipe: Pan-Seared Brussels Sprouts with Cranberries and Pecans by Rachel Schultz. Image from Rachel Schultz. Please respect the creator and pin from the original site! I like brussels sprouts, but I don't have them often, because they're usually kind of boring. I had never tried them in a recipe like this. Now, if you're not a fan of brussels sprouts, you won't like this recipe, but if you are, you should give it a try. This dish really fancies-up boring old brussels sprouts, and makes an impressive-looking side. I would recommend using fresh sprouts, though. I used frozen (because the recipe doesn't specify) and mine didn't look nearly as pretty as hers. The taste wasn't affected, though! The combination really worked well: the tart cranberries, the tangy cheese, and the crunchy pecans all complemented the brussels sprouts perfectly. It didn't take too terribly long to prepare, either. The longest part was prepping the sprouts, but it wasn't too tedious. All in all, my final rating is 3.5 out of 5 stars. Give it a try the next time you want a fancy side dish! Need a tasty main dish to go with this recipe? 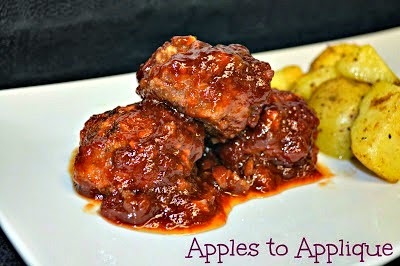 Try my Sweet and Smoky Barbecue Meatballs. Ok I can do the meatballs! Now those brussel sprouts... I don't know.. I have never had one but .. oh my it does look good. Lol, that's how I've always said it, too, but in a few recipes (like this one) they added the s, so I assumed that was proper. I'll have to look it up! I really need to learn to make brussel sprouts! I have never really liked them, but I have heard you HAVE to cook the right or they are bad! lol! I think that's probably true! This recipe is nice because it has a lot of other flavors going on besides just the sprouts.